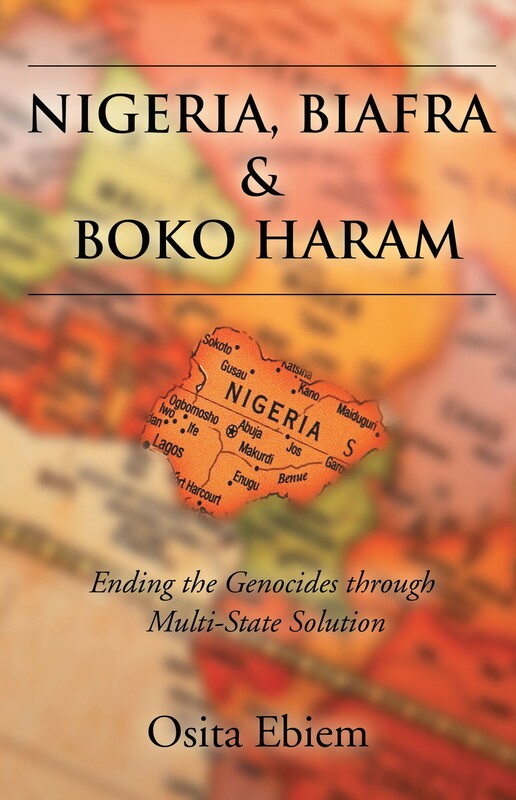 In his book, Nigeria, Biafra, and Boko Haram: Ending the Genocides Through Multistate Solution, author Osita Ebiem fashions a compelling argument for finally partitioning Nigeria into distinct countries. Through the use of the multi-state solution and the principle of Self Determination, the widely diverse Nigerian ethnic identifications—Igbo, Yoruba, Hausa/Fulani—would be unimpeded in practicing their religious, cultural, and social differences and help initiate and accelerate growth, prosperity, end impunity and entrench sanity, law and order in the various emerging new countries..
With detailed precision, Ebiem explores the annals of Nigerian history and explains in clear terms the evolution of a country forced together by European commercial interests. The portrait of an utterly disastrous One Nigeria is often haunting and unbelievable; and though the country and its people have endured trauma beyond comprehension, Ebiem offers practical solutions, which can reroute Nigeria’s path and ultimately begin the long process of healing.